Want more photos from our trip? Click here! Greece offers cheap (and short) flights, reasonably priced accommodations and a bounty of interesting things to see — I mean, it is the birthplace of democracy, after all, and the Apostle Paul preached there. Plus the food is fantastic, but more on that soon. Our plan is to catch a quick flight out of Budapest and spend 10 nights in Athens at a little Airbnb we’ve lined up near Lycabettus Hill. The weather looks hot and dry — 80s and 90s all week, with no rain in sight. This is good news, as we’ve also booked a short cruise(!). 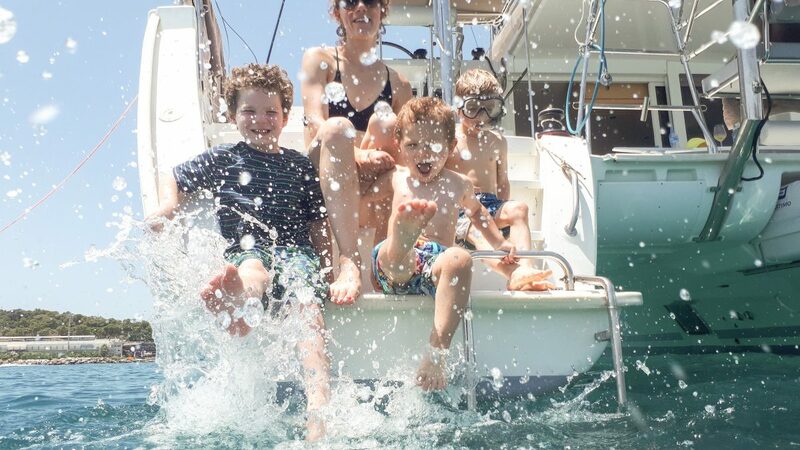 In planning the trip, we weighed our options for visiting one or more of Greece’s famed islands but determined it would be both too expensive and too demanding for our young crew. 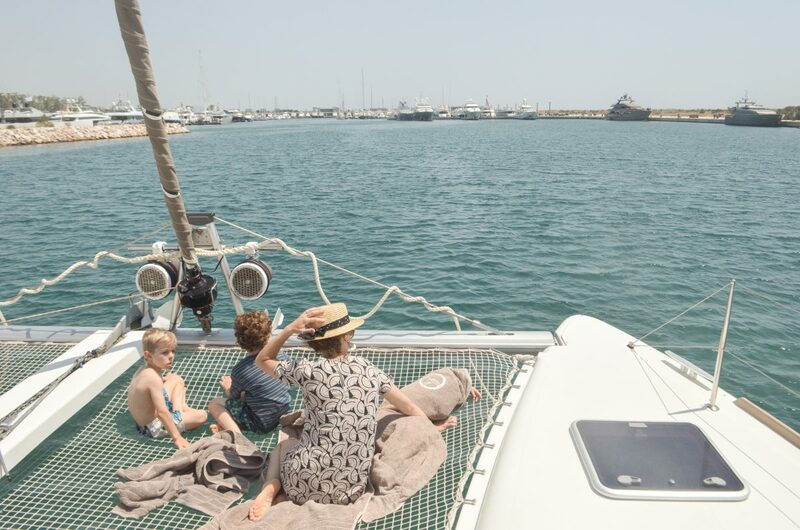 Our consolation was a kid-friendly day cruise in the Athens Riviera, which proved to be a highlight of our trip, not least of all for the boys. When flying direct from Budapest, there are two mainland destinations: Athens and Thessaloniki. Most of the islands require connecting flights or flight + ferry, but Corfu is an exception. Flight times are two hours or less. 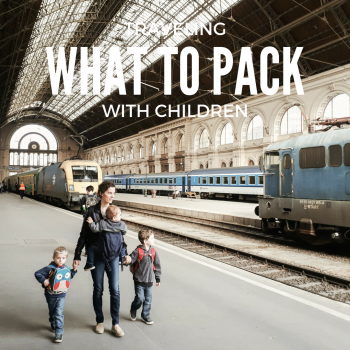 We paid $400 for our family of five to fly round-trip from Budapest to Athens with Wizz Air. I think booking in advance (about three months ahead, in this case) and making use of the Wizz Discount Club (which, with five passengers, can save you money on the first trip) played a big part in that price. In contrast, if booking a flight during the summer only one week in advance, we’d be looking at double or triple that price! We’ve flown out of Budapest enough times now to appreciate the simplicity and smoothness of the Budapest airport. Our plane takes off and lands as scheduled, cruising into Athens at 1:15 p.m. local time. The Athens airport gets a lot of passenger traffic (almost 22 million passengers in 2017), and it’s a larger airport than many that we’ve seen recently. It’s not huge, by any stretch, but it’s a lot bigger and more developed than, say, the Sarajevo airport, which we flew into last summer, and its 1 million passengers per year. Athens has a metro line that reaches the airport, and to take it into town, special EUR 10 tickets are required. We buy two adult tickets (kids age 0-6 ride free on all Athens’ public transit — yay!) and settle down for a 30-minute ride. Twice on the trip, accordion-playing buskers pass through the aisles, playing Greek-sounding tunes and asking for spare change. We emerge from the subway at the Ambelokipi stop into a foreign world of balconies, bougainvillea, narrow sidewalks and graffiti-covered buildings. Our apartment is a 15-minute walk up the street, and since it’s hot and we’re sticky, we set off straight away without taking much time to look around. 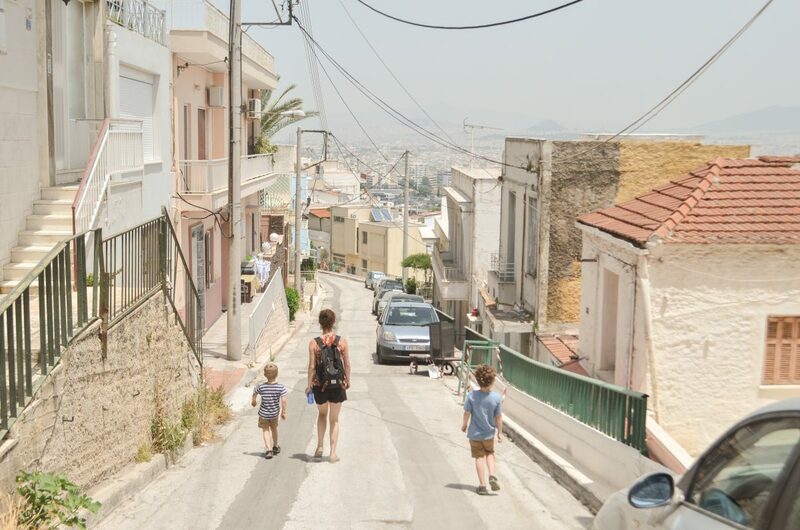 One thing we do notice on our way is that Athens is not a terribly walkable city. It has a wholly different vibe from what we’re used to in Budapest, and one of those differences is that sidewalks are either crowded, uneven, slippery, parked on or non-existent. Often all five. It’s beautiful, though, and we enjoy the walk — tired and sweaty though we are — to the flat. We unload our things, explore our new digs and gather ourselves for a walk to the grocery store. After all, success with kids in a new city rests on 10 percent luck, 10 percent pluck and 80 percent having food in the fridge. Thankfully, the boys love Greek yogurt. Now let the tripping begin! 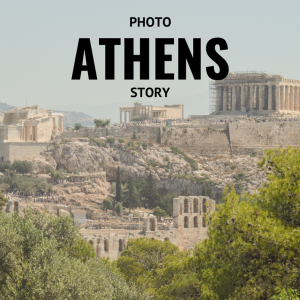 The features that stood out to us in Athens were the hills, the history and the food. The great news is that you can combine all three for a delicious and budget-friendly adventure in the City of the Violet Crown. Here’s how we did it. Don’t stay where we stayed in Athens! First, we went a little too “budget” on this one and consequently were less comfortable than we would have liked. Lesson learned: When choosing an Airbnb in the future, we will make sure it has a family space to gather for meals and relaxing and we will be more leary of homes without reviews. Perhaps the biggest drawback of the apartment we occupied, though, was its location, near Lycabettus Hill. It’s a steeply pitched neighborhood positioned northeast of the city core, not well-connected with public transit. We spent many afternoons trekking under the relentless sun across town back to our apartment. Save yourself the struggle, and stay in a central neighborhood like Syntagma, Monastiraki, Plaka or Makrygianni. 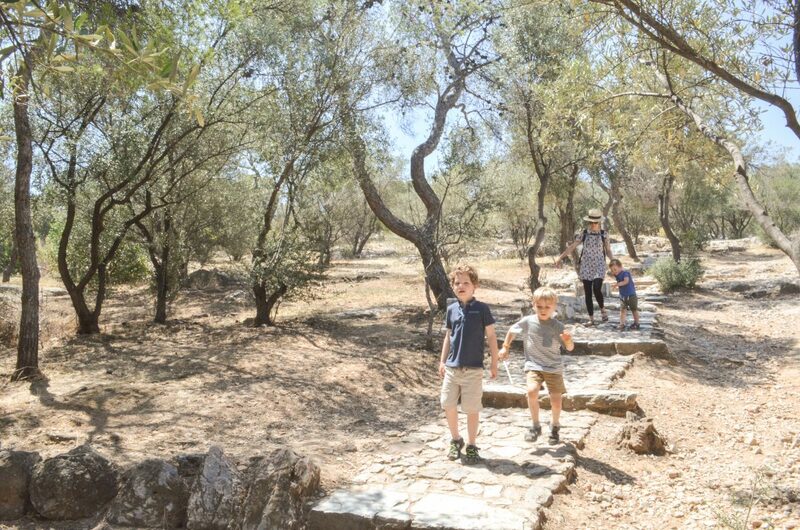 Google Maps tells us that a 30-minute trek should take us to the summit of Lycabettus Hill, the tallest point in Athens proper, with an approach from the southwest. In reality, the hill is criss-crossed with trails, and we were able to take a much more direct route from our Airbnb. The walk seems a little short, honestly, and we arrive, amid a gaggle of other American tourists, to take in expansive and beautiful views of the city below. The Acropolis is there, topped by the Parthenon, and we can see past that all the way to the blue Mediterranean. Apartment buildings fill most of the rest of the visible space. Athens is a city of 4 million people, home to 60 percent of the people who live in Greece. It’s pretty crowded. Twice as many people live here as in Budapest. That’s Lycabettus hill back there. On our third day in Athens, we set out early to walk toward the Acropolis area. 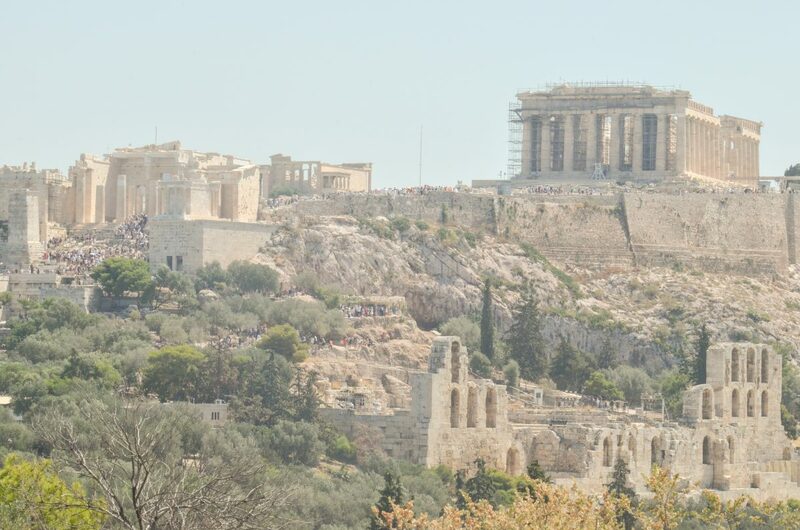 The Acropolis is the hill on which sits the Parthenon and a number of other iconic Greek structures. Strewn all about it are a number of other sites, most of which require a small fee for access. 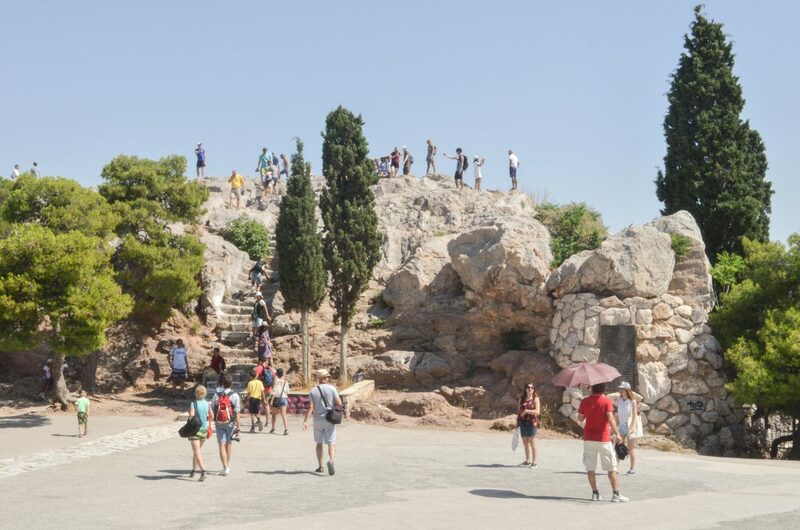 We still weren’t sure whether we’d pay for five us us to access the Acropolis itself amid hundreds of other tourists under the sun (we didn’t), but we’d heard that certain sites — the Areopagus, for one — are free to access. We decide to give those a try and see whether they sate our appetites for more. Either way, we definitely plan to return to Greece in the future when the boys are older, so we’re not afraid that we’ll be missing out if we skip something this time around. The boys nosh on our daily mid-morning snack in Athens: koulouri, or large bread rings, that go for just €0.50 each. We wash them down with Greece’s beloved instant coffee drink, the frappe. Try a Gregores (Γρηγόρης) cafe — which are almost as prevalent and hunter-green as Starbucks are in our homeland — for the icy drink. 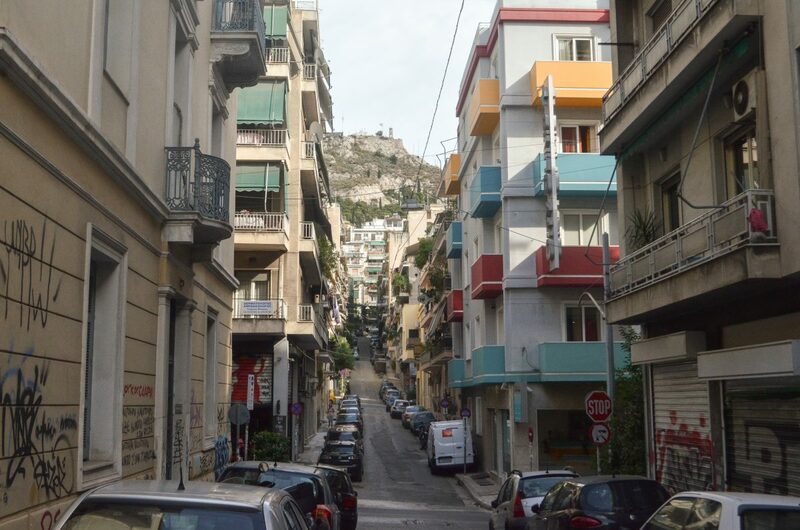 Our walk toward the Acropolis takes us through some lively downtown neighborhoods full of shops, restaurants and lines of mopeds. Again, the feel in Athens is far different than in Budapest. In our experience, we’d liken it more to Madrid than to anywhere else we’ve been. So, the sheer difference of the experience is (free) fun for us. Athenians don’t believe in paved sidewalks, apparently. Walkways are all made of large marble and slate tiles, cut with grooves on the hillier portions and worn smooth — and slippery — in the flat areas. The boys love this, and together we make a loud, hopping, skipping storm tumbling down the narrow streets. We pause occasionally to rest, and on two separate occasions we are warned by friendly strangers that it’s best not to sit here or stand there because “this is an area for junkies, and there might be needles.” OK, we say. We move on. 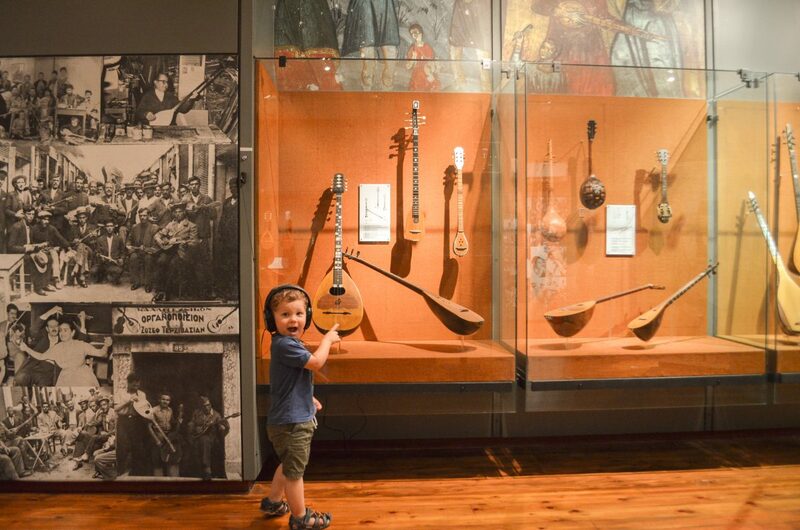 We step into a free music museum, the Museum of Greek Folk Instruments, which proves a delight. On permanent display are a variety of Greek musical instruments, with corresponding headsets that allow us to hear what those instruments sound like. The boys — Job in particular — are enthralled. After half an hour or so, we’re ready to step back into the sun and climb up to Mars Hill. The boys — Job in particular — are enthralled by the Museum of Greek Folk Instruments. What stands out to me most about the Areopagus is the fact that it’s just a hill. There’s not much to it; it’s just a small limestone and marble outcropping that, while affording great views of Athens, is still just a rocky hill. It doesn’t glow or anything, and it’s not gilt with gold. This places into relief, though, the value of what happened there. It’s not the hill itself that’s important, but what happened there. The Apostle Paul, having been heard earlier preaching about Christ in the Agora below, ascends Mars Hill to speak to the Greeks about God. It’s a scene that God felt important to include in the Bible, in a place that God felt important to mention by name. And we’re here, having ascended the same stone steps that Paul did, standing in the same place that Paul did, looking at the same scenes that Paul did. It’s hard to grasp the full realization of that, with children racing ahead of us and pickpockets trailing us and selfie sticks bumping into us. But we’re here, in Athens, standing on the exact same stone that Paul did 2,000 years earlier when he taught the Athenians all about the “unknown” god. Mars Hill can be full of people during the high season, but it’s nonetheless a neat thing to see. 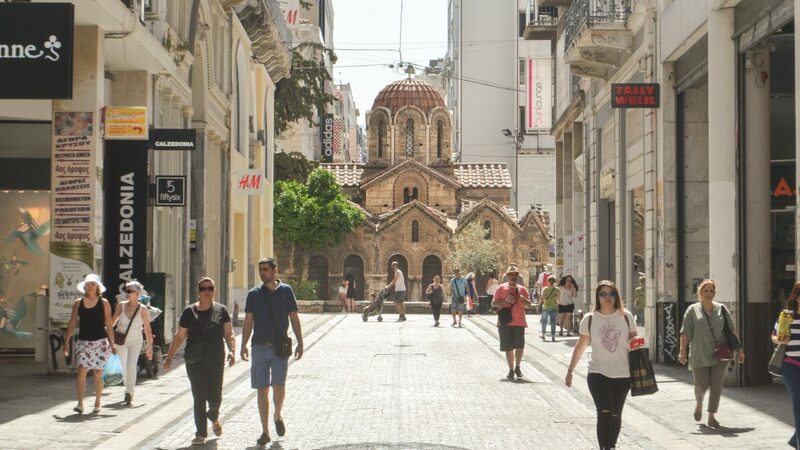 On our fourth day, we decide to head toward the botanical garden at Syntagma Square and then meander back to town on the hunt for good Greek street food. Spoiler: We found great Greek street food. More on that later. 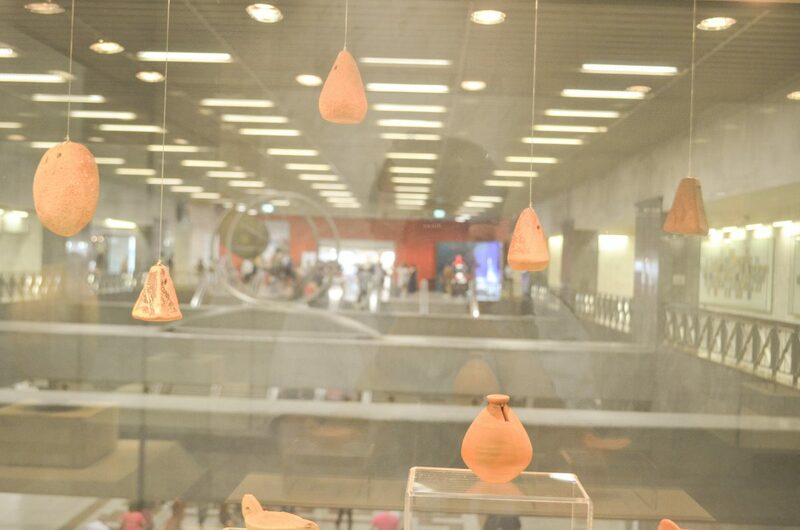 But first we descend to the metro station at Syntagma Square, which is one of four stations adorned with ancient items, many unearthed while the metro system was dug. (The other three stations are Acropolis, Panepistimio and Monastiraki.) 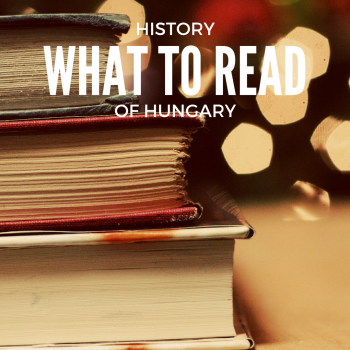 Here are early Christian burials, wine amphorae from the 1st century, columnar Roman headstones and much more. For the price (free), it’s a wonderful little overview of Greek archaeological history. 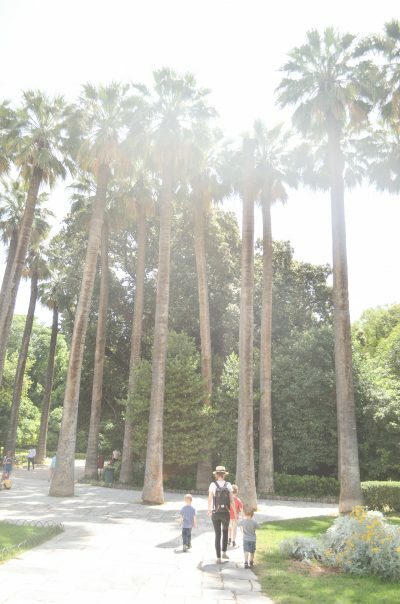 We come up from underground at the edge of a beautiful and extensive botanical garden. Myriad paths wind through the tall trees, and little gazebos and ponds seem to be hiding all over the park. To eat our mid-morning snack, we settle in a courtyard covered by vines. The next stop on our walk is the temple of Zeus, which is another paid site that’s nonetheless perfectly visible (just not as up-close) from behind the fence. 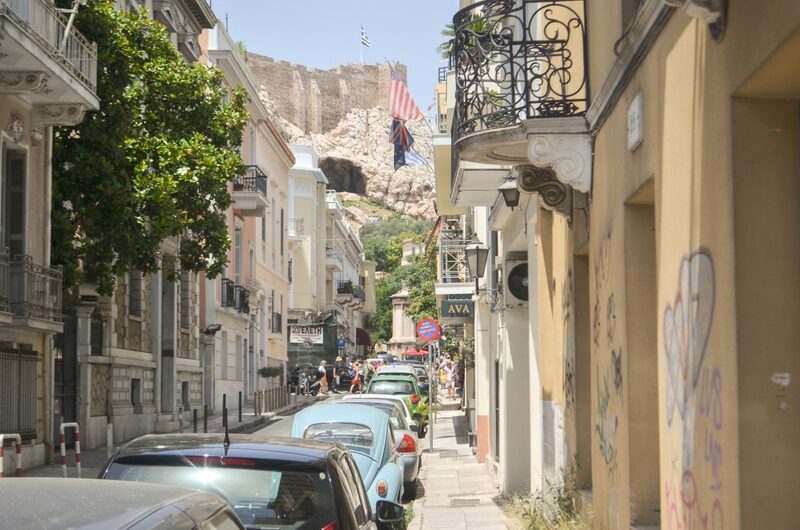 We settle for that and then wander across a busy street toward the Plaka neighborhood at the base of the Acropolis. It’s a gorgeous but kitschy tourist trap, reminiscent of some of the main walks in Mostar or Venice, and not the best scene for a young family because of all the people and trinkets to bump into. It’s after 1 by now, and we’re cognizant of the fact that we’re still more than 45 minutes from home in the 90-plus degree heat, and we haven’t eaten lunch yet. 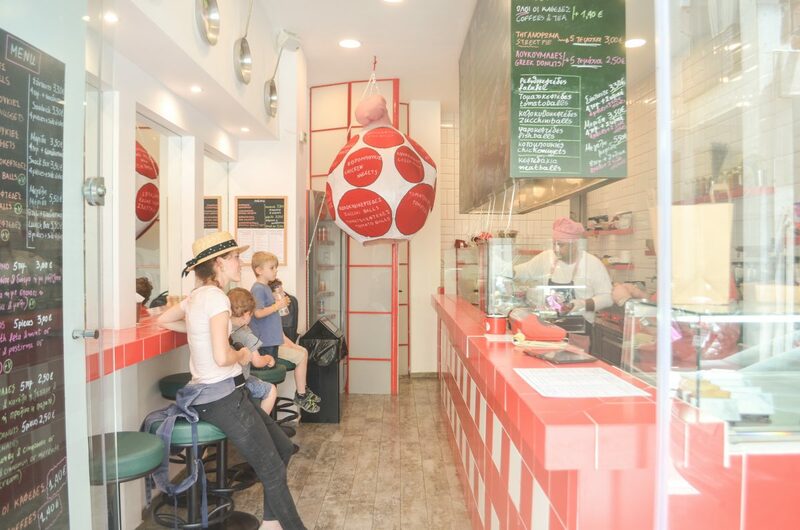 We cross our fingers for a traditional Greek gyro or souvlaki stand. What we find might be even better: a little place called Street Ball Handmade Greek Food, where we get a truly massive meal for just €16.50, enough to feed our hungry family of five, with leftovers. Here’s what we get: Eight falafel balls (breaded, deep-fried falafel), four zucchini balls, four meatballs, french fries, cabbage salad, fry bread stuffed with mint and feta cheese, regular bread, and kouloumades, or Greek donuts, drizzled with honey and dipped in chocolate. By the end of our meal (which we’ve taken home and eaten in the courtyard behind our flat), we’re already making plans to go back. It was seriously good food, if a tad unhealthy, and the staff was super friendly. Street Ball! So delicious we went twice. After all the walking through hot, dry Athens, a day out on the water sounded like a nice reprieve. Brittany had booked us this trip several months earlier through a local group called Kids Love Greece, which set us up with Sailing Athens for the trip. From the start, it was a wonderful day. Sailing Athens sent a driver to pick us up at our apartment (Job called it the “van bus,” and the ride was the highlight of his day) and ferry us to the marina about 20 minutes away. 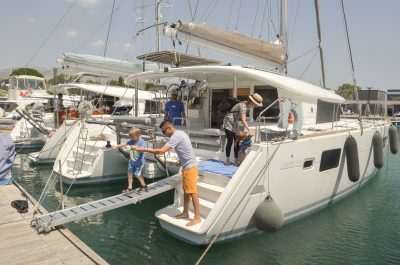 Our boat is a catamaran, big enough for about 10 people. A couple of padded benches in the back surround a dining table, and in the front, between the two pontoons, is a wide net that makes a fun and safe place for the boys to lounge while the boat cruises through the water. The weather is perfect. It’s hot, maybe in the low 90s, and a slight Mediterranean breeze picks up as we leave the marina and slice into the open water of the Athens Riviera. It’s beautiful. Though the landscape beyond the shores is largely barren, its undulating, scrubby hills are the perfect backdrop for the gleaming white buildings clustered near the shore. We mostly stay within viewing distance of the shore as we motor — the sails are down, and we’re under engine power — toward our first anchor point a few hundred meters off of an uninhabited island. The sea beneath us is a sparkling turquoise-blue. The depth here is about 9 meters, our skipper tells us. As soon as the anchor lines are out, we’re diving off the back of the boat into the surprisingly warm sea. The boys mostly just cling to the boat like barnacles, dipping their masked faces into the water in search of fish. Occasionally, they let me pry them from the ladder to take them out into the open water. At our second stop, just around the corner from where Aristotle Onassis used to take Jackie O for vacation, in a bay spotted by a handful of multi-million-dollar yachts, our hosts prepare lunch while we dive, swim and snorkel. The food is amazing. A first course of Greek salad, bread and roast vegetables is soon followed by delectable grilled pork and chicken. Before we can finish those rounds, plates full of shrimp and squid appear. It all tastes incredible. We fill our bellies and settle down for the lazy ride back to port. Our youngest even dozes under a blanket on the net. This is what parenting dreams are made of, we think, as we roll to the rhythm of the surf and try not to nod off ourselves. In the days of ancient Greece, Piraeus was a port city on the Mediterranean, several kilometers from Athens, which sits inland. 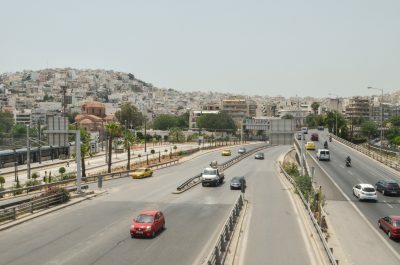 High walls surrounded Athens and guarded both sides of the road to Piraeus, protecting the city’s valuable link with the port and the outside world. Today, Piraeus is a bustling city, with docks for numerous ferries, cruise ships and fishing vessels. One of the metro lines ends in Piraeus, and we decided to go check it out. 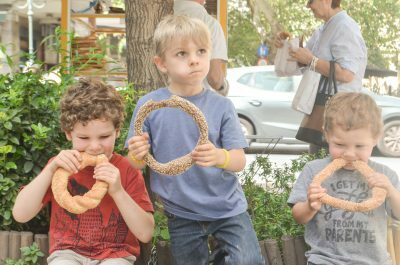 Along the walk to the metro station, we grab what by now has become a daily mid-morning snack: koulouri, or large bread rings, that go for just €0.50 each. Piraeus is fun. The metro dumps us off near the water, in the midst of a busy area full of shoppers, tourists, travelers, fishermen and locals. We stop for a frappe, a ubiquitous drink in Greece, made from instant coffee pureed with ice, usually with milk and sugar added. If you’re not used to the (awful) taste of instant coffee, we’d recommend the sweeteners. But a frappe with sugar and milk is actually quite a delicious and refreshing drink — and cheap. The penultimate metro stop on this line is across town, so we decide to head that direction while taking the opportunity to explore Piraeus and hike up into its hills for views of the sea. We’re rewarded with stunning though hazy views of the sea. Off in the distance, we spot the marina from which we sailed the day before. The metro station is another 30 minutes away, but we make it with little difficulty, distracted by the cuteness of both the hillside town we’re in and the myriad stray cats that wander by. Walking through Piraeus, a remarkably shade-free port city (especially at high noon) just outside of Athens. 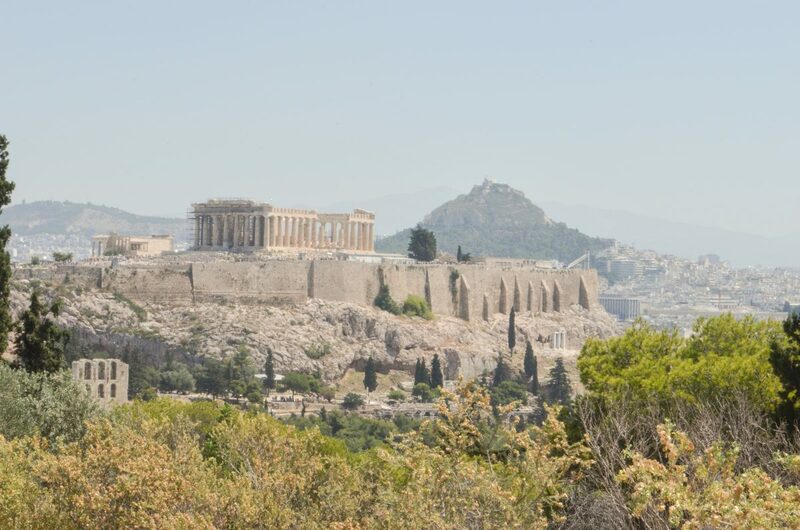 The historical hotspots in Athens are a group of hills clustered in the center of the city. There’s the Acropolis, of course, which houses the Parthenon and a number of other buildings important to the men and women of ancient Athens. Mars Hill, where Paul preached, is a small outcropping about halfway down one slope of the Acropolis. The Pnyx is a slope in full view of both both Mars Hill and the Acropolis where the voting men of Athens would gather to conduct the business of the city. Filopappou Hill, also known as the Hill of the Muses, rises above all of these, affording wonderful views of the city and lovely walking paths on which to stroll in the hot sun. Trekking back down the Hill of the Muses. One thing we noted about Athens is that there are plenty of trees, but none of them really offers much shade. 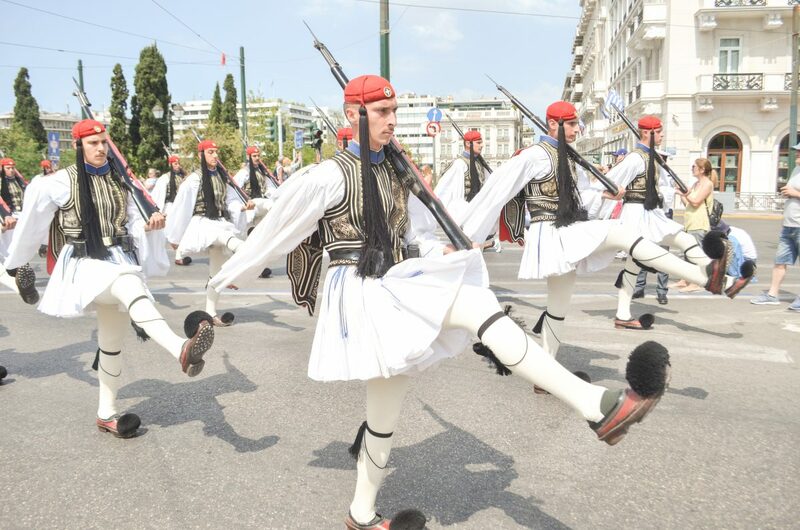 It’s Sunday, and since we don’t have a church to go to in Athens, we decide it might be fun to take a short walk to the Greek parliament building to watch the changing of the guard. It’s a famously showy affair, especially the 11 a.m. Sunday ceremony, and thousands of people have shown up to watch. We’re in the back of the pack and miss the main action, but we have front-row seats to the marching-band-led procession into and out from the parliament grounds. So … the changing of the guards is impressive, but maybe don’t go on Sunday morning unless you get your kicks from elbowing your way through throngs. The Sunday version of the changing of the guard is a popular affair, but great views can be had of the procession into and out of the parliament area. The eighth day is airport day. And just like that — because in tiny Europe, you can pass among numerous varied and disparate cultures in no time at all — we’re back home in familiar Budapest, drinking spicy water and breaking out the LEGOs. Build excitement for your visit by introducing your kids to Greece’s rich history, culture and language. 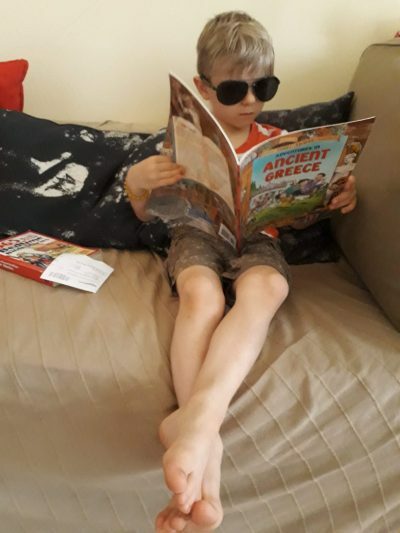 For young kids, books like Adventures in Ancient Greece and YouTube videos about the Greek alphabet and culture are a great place to start. Older kids could also begin a fruitful study of the Greek alphabet or Greek roots. Here’s a playlist of videos we used to introduce the boys to the Greek alphabet, culture and more. It’ll be you against the sidewalks, and you will likely lose if you try to use a stroller. You’ll fare better with a carrier of some sort. We’re still going strong with our Ergobaby carrier despite almost seven years of use and one particularly beastly toddler. This city is slippery! The sidewalks, the streets, the Areopagus — choose footwear carefully. Food is kid-friendly: pitas, koulouri, loukamades, fries. Book accommodations in downtown — walking in from the hills every day, especially in the heat, is grueling. Take care where you rest. On two separate occasions we were warned by friendly strangers that it’s best for our kids not to sit here or stand there because “this is an area for junkies, and there might be needles.” Good to know. You don’t have to pay and visit the famous sites. As in Barcelona, where we decided that views of Park Guell’s treasures from the hillside above (rather than inside the gated area) would suffice, in Athens we decided to simply enjoy such sites as the Acropolis and Hadrian’s Library from the outside rather than pay for all of us to wander through. Go ahead, call us cheap if you want to. We got what we wanted.